The Danish leg of the PokerStars European Poker Tour has seen over 423 players take to the tables in a bid to win a first-place prize of 3,675,000DKK (£430,000). Just 263 of them remain and will reconvene today for Day 2 of the event. Day 1a chip leader Andrew Pantling has not been ousted, though he now has considerably more competition as play recommences. Ilkka Koskinen has 140,900 with PokerStars pro Sebastian Ruthenburg right behind him on 140,800. 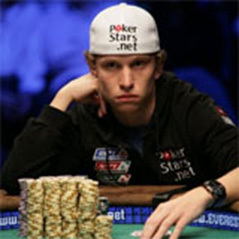 PokerStars Pro and 2008 WSOP winner Peter Eastgate is also in fine shape on a little less than 130,000. Unsurprisingly, tournament maestro and PokerStars pro Bertrand “ElkY” Grospellier is right up there in the chip counts with over 110,000 and will probably win it. He tends to do that in tournaments. Luca Pagano and William Thorson are two more PokerStars players to watch out for, with Michael “Beppe from Eastenders” Greco surviving Day 1b with 40,000. Join us tomorrow to find out who’s gunning for the final table.